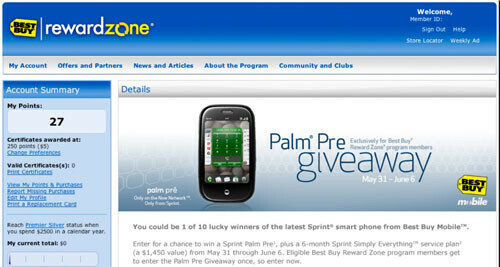 Best Buy contest to win Palm Pre and 6 months of service starts today-or does it? A few days ago we reported about a contest being run by Best Buy. The big box retailer was offering a Palm Pre with 6 months of free Sprint service to ten different members of the their Reward Zone membership club. Entry date was to be between today (5/31 for the calendar impaired) through the launch date of June 6th. Sounds simple on paper, but it looks like something has gone awry. No matter how hard we try, we cannot seem to find the place on the Reward Zone web site that is taking entries. And it is not just a lack of brain cells on our part because a number of people have written emails to BGR complaining that they cannot find where to go on the RZ site to enter. Putting on our Sherlock Holmes hat, it looks like most of those complaining are premium silver members of the Reward Zone, so that might have something to do with it. If you are a Best Buy Reward Zone member and you have managed to enter the contest, let us know where the entry form is. Yes, statistically you might be making it harder for you to win by giving out that information to others, but you will probably sleep better at night knowing how you have done such a great deed for all of mankind. I have been LOOKING all day, there ain't S&*T !!!!!!! What a scam, I looked atleast 10 times since this morning. The last time was at 8:15 P.M., New York Time....... I am even have a Silver Reward Zoze membership. new york is the best place..how do live TV shows work in cali? like the today show. do people in LA get up at 4 AM? what about american idol, do they watch it at 5? so does that mean you don't watch it live? if I see it at 8PM too? I have entered. I went to the website and logged in with my rz number and password, and it was one of the 3 ads on the top of the page under the header. I have the regular rz membership, not the silver. I just entered...... It is up NOW!!!!!!!!!!!!! !